How did the Ukrainian Fashion Week hold its spring-summer season of 2019, dedicated to “sustainable consumption”? A total of 72 designers, 50 shows, 9 presentations, 3 special projects, all in seven days demonstrating the super power of the Ukrainian fashion – these are just some of the numbers describing the Ukrainian Fashion Week SS19. The headliners of the Ukrainian Fashion Week SS19 included designers and brands that have successfully represented Ukraine in the world fashion arena: POUSTOVIT, LAKE STUDIO, IENKI IENKI, RUSLAN BAGINSKIY, and KSENIA SCHNAIDER. Lilia Litkovska, too, has returned after a creative pause in our market. Since last year, she had been showing her new collections only in Paris. However, she held a presentation of her brand’s collection LL by Litkovskaya on August 31 within the framework of the Ukrainian Fashion Week. The LL is Litkovska’s city brand, founded in 2013. Democratic and urban in appearance, it transmits the main values of the designer, but speaks in a simpler language. Over five years since it started operating, the brand had already been recognized in France, the US, Korea, Japan, Kuwait, and elsewhere, but had not been officially presented to the Ukrainian public until 2018. To fix this, Litkovska held a presentation of the LL summer collection in Kyiv. The show took place on the steps of the Toronto-Kyiv Business Center on August 31, 2018. Singer Alina Pash became the face of the LL by Litkovskaya label, having broken into this country’s musical scene this summer with her single Bitanga. Another major figure of the Ukrainian fashion industry, Lilia Pustovit, had a debut of sorts as well. Ukrainian designer Pustovit devoted her new spring-summer collection to the freedom which started for her with the very choice of venue. 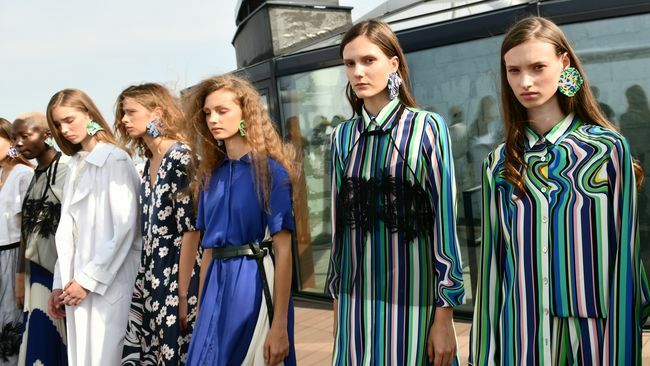 Her brand, which traditionally holds presentations on the main Ukrainian Fashion Week podium, showed the new season collection on the roof of the Skyline apartment block, where clouds offered the best backdrop for gentle images of the POUSTOVIT brand. Models in snow-white attire (since the white color in various shades and factures was the preferred choice in the brand’s spring-summer collection of 2019) resembled free birds who know no borders. The designer herself compares this playing with whiteness to artworks of the impressionists, which always emanate feelings of understatement and lightness. “This is a great season. The authority and popularity of designer brands that take part in the Week, the number of collections on offer, the scope of projects – the Ukrainian Fashion Week SS19 is very impressive. Speaking of the keyword of this season, I would say it is ‘responsibility.’ Several projects are dedicated to responsible clothing and responsible consumption. The Forum of Creative Industries is dedicated to one’s responsibility for the nation’s authority and for the quality of the exported ‘product.’ The 43rd and all previous seasons of the Ukrainian Fashion Week are dedicated to the responsibility for the development of the Ukrainian fashion industry as a whole,” organizer of the Ukrainian Fashion Week Iryna Danylevska noted at the pre-event press conference. Yet another feature of the Ukrainian Fashion Week this season was the fact that the organizers dedicated it to the sustainable development, which is a “fashionable” theme all over the planet. The sustainable fashion is a new philosophy of contemporary fashion aficionados, including environment-friendly clothing, wearing vintage attire, engaging in clothing exchange, recycling and upcycling, ethical production, high quality and timeless designs. Accordingly, all events of the Ukrainian Fashion Week SS19 were aimed, as said by the organizers, at shaping a new fashion philosophy in Ukraine. “We will talk about things which are important for fashion, about the need to consume clothes very consciously. And we think designer clothes offer an alternative to the so-called fast fashion, when you buy a very cheap T-shirt, and throw it out after five days because it has either lost its qualities or you are not interested anymore, and it is so cheap that you can afford to throw it out, etc.,” Danylevska told us. The sustainable fashion is also a thing within the so-called slow fashion concept. The slow fashion is when a dress, a bag, a pair of boots, or something else does not tell everyone what season you bought it in. This is when the fabric is high-quality and natural, when the leather is well-treated, or, if it is a synthetic material, or as it is now called, a material of the “new generation,” it must necessarily be ergonomic, that is, pleasing to the body and not obstructing the normal processes of our body’s life. If it is so, that item lives with you for more than just a season and is relevant for many occasions. The Ukrainian Fashion Week SS19 designers used different approaches to cope with the task. Some, such as the IRYNA DIL brand, took a literalist approach and showed a collection done in the “maximally natural” style which bordered on country. Sensual sarafans, suits, shorts, light summer coats and jackets, truncated overalls, flower motifs of bespoke prints, characteristic sophisticated embroidery, a variety of facture elements, as well as ruffles, flounces, draperies, fringes, openwork... Fabrics used included silk, chiffon, flax, batiste, viscose, tricot, as well as oilcloth and cotton sprayed with latex, as an embodiment of the spirit of the IT epoch. The dominant colors were shades of yellow, red, green, milky, beige, powdery, and pale light-green. The images were complemented by straw hats and baskets full of field flowers. A special service called Fashion Tech Ukraine was featured as part of this year’s Ukrainian Fashion Week. This is a unique image creation service, which is another example of the use of artificial intelligence in the fashion industry. The service shows how new technologies change our lives and promote the conscious consumption movement, which helps us make mistake-free choices when shopping online. Also, the Ukrainian Fashion Week continues to work with the British Council on the program of support and development for young designers of Ukraine, called the Fashion DNA-Ukraine. This year’s Fashion DNA-Ukraine program focuses on the special features of brand promotion in the digital space and emphasizes the financial aspects of e-commerce. Within the framework of the Ukrainian Fashion Week’s new season, the Mystetskyi Arsenal will host the presentation of the project’s final creative part. Its mentor has been British digital art director Jon Emmony, whose portfolio includes working for Kanye West, the Victoria and Albert Museum, Nike, and other customers. Representative of the retail platform Farfetch and British consultants selected eight Ukrainian brands – Kir Khartley, Elenareva, The Coat by Katya Silchenko, Jean Gritsfeldt, FROLOV, Roussin, Gasanova, and Marsala – to participate in the project. Together with the Seentax Services creative team, which includes art directors Liubov Kucheriava and Vlad Dmytriiev, photographer Misha Bochkariov, sound designers Sasha Zlykh and Danylo Senichkin, 3D modeler Volodymyr Kozlov, and curator Ira Lupu, the designers have created an interactive website where digital sculptures help to reveal the designer’s world and the mood of the collection.